U.S. government trade figures for the first 10 months of 2017 indicated raw material imports were up in two categories outlined: hog bristle and broom and mop handles, compared to the first 10 months of 2016. For October 2017, three categories reported decreases: hog bristle, brush backs, and metal handles, compared to October 2016. Import totals for the first 10 months of 2017 were up in four finished goods categories outlined: hairbrushes, paint rollers, paintbrushes and upright brooms, compared to the first 10 months of 2016. In October 2017, five categories outlined recorded increases: brooms of broom corn valued at more than 96 cents, brooms and brushes of vegetable materials, hairbrushes, paint rollers and upright brooms, compared to October 2016. ﻿The United States imported 18,146 kilograms of hog bristle in October 2017, down 27 percent from 24,855 kilograms imported in October 2016. During the first 10 months of 2017, 332,557 kilograms of hog bristle were imported, up 87 percent from 178,193 kilograms imported during the first 10 months of 2016. China sent 325,418 kilograms to the United States during the first 10 months of 2017. The average price per kilogram for October 2017 was $48.70, up 71 percent from the average price per kilogram for October 2016 of $28.49. The average price per kilogram for the first 10 months of 2017 was $21.24, down 11 percent from the average price per kilogram of $23.93 for the first 10 months of 2016. ﻿The import total of broom and mop handles during October 2017 was 2 million, up 54 percent from 1.3 million for October 2016. During the first 10 months of 2017, 16.1 million broom and mop handles were imported, up 13 percent from 14.3 million for the first 10 months of 2016. During the first 10 months of 2017, the United States received 7.1 million broom and mop handles from Brazil, 4.9 million from Honduras, 2.5 million from China and 1.3 million from Indonesia. The average price per handle for October 2017 was 89 cents, up 9 percent from 82 cents for October 2016. The average price for the first 10 months of 2017 was 81 cents, down 8 percent from 88 cents for the first 10 months of 2016. ﻿October 2017 imports of brush backs totaled 310,041, down 53 percent from 658,895 for October 2016. During the first 10 months of 2017, 4.4 million brush backs were imported, down 27 percent from 6 million for the first 10 months of 2016. Both Canada and Sri Lanka shipped 1.8 million brush backs to the United States during the first 10 months of 2017. The average price per brush back was 66 cents during October 2017, up 40 percent from 47 cents for October 2016. For the first 10 months of 2017, the average price per brush back was 52 cents, up 13 percent from 46 cents for the first 10 months of 2016. ﻿The import total of metal handles during October 2017 was 1.9 million, down 46 percent from 3.5 million for October 2016. During the first 10 months of 2017, 18.9 million metal handles were imported, down 16 percent from 22.4 million for the first 10 months of 2016. During the first 10 months of 2017, China exported 7.9 million metal handles to the United States, while Spain sent 6.3 million and Italy shipped 4 million. The average price per handle for October 2017 was $1.08, up 61 percent from 67 cents for October 2016. The average price for the first 10 months of 2017 was 94 cents, up 4 percent from 90 cents for the first 10 months of 2016. ﻿The United States imported 649,607 brooms of broom corn valued at more than 96 cents per broom during October 2017, up 20 percent from 541,855 for October 2016. During the first 10 months of 2017, 5.9 million brooms of broom corn were imported, down 8 percent from 6.4 million for the first 10 months of 2016. Mexico sent nearly all the brooms to the United States during the first 10 months of 2017. The average price per broom for October 2017 was $2.29, down 5 percent from $2.40 for October 2016. The average price per broom for the first 10 months of 2017 was $2.37, down 5 percent from the average price for the first 10 months of 2016 of $2.49. ﻿The import total of brooms and brushes of vegetable material during October 2017 was 206,415, up 58 percent from 130,436 brooms and brushes imported during October 2016. During the first 10 months of 2017, 2.3 million brooms and brushes were imported, down 21 percent from 2.9 million for the first 10 months of 2016. 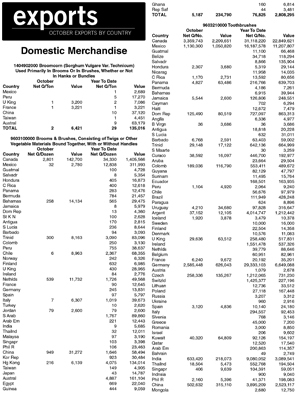 Sri Lanka exported 1.3 million brooms and brushes to the United States during the first 10 months of 2017. The average price per unit for October 2017 was $1.10, down 25 percent from the average price for October 2016 of $1.46. The average price for the first 10 months of 2017 was $1.48, up 29 percent from $1.15 for the first 10 months of 2016. ﻿The United States imported 94.8 million toothbrushes in October 2017, down 1 percent from 95.5 million imported in October 2016. During the first 10 months of 2017, 914.8 million toothbrushes were imported, down less than 1 percent from 917.4 million imported during the first 10 months of 2016. China sent 702.7 million toothbrushes to the United States during the first 10 months of 2017. The average price per toothbrush for October 2017 was 22 cents, up 10 percent from 20 cents for October 2016. The average price for the first 10 months of 2017 was also 22 cents, the same as for the first 10 months of 2016. ﻿October 2017 imports of hairbrushes totaled 4.5 million, up 7 percent from 4.2 million for October 2016. During the first 10 months of 2017, 42.4 million hairbrushes were imported, up 12 percent from 37.7 million for the first 10 months of 2016. China sent 42.3 million hairbrushes to the United States during the first 10 months of 2017. The average price per hairbrush was 26 cents during October 2017, up 1 cent from the average price for October 2016. For the first 10 months of 2017, the average price per hairbrush was 24 cents, down 1 cent from the average price for the first 10 months of 2016. ﻿The United States imported 4.7 million shaving brushes in October 2017, down 29 percent from 6.6 million imported in October 2016. During the first 10 months of 2017, 48.3 million shaving brushes were imported, down 27 percent from 66.1 million imported during the first 10 months of 2016. China sent 34.2 million shaving brushes to the United States during the first 10 months of 2017. The average price per shaving brush for October 2017 was 15 cents, up 50 percent from the average price for October 2016 of 10 cents. The average price for the first 10 months of 2017 was 14 cents, up 1 cent from the average price for the first 10 months of 2016. ﻿The import total of paint rollers during October 2017 was 5.4 million, up 6 percent from 5.1 million for October 2016. During the first 10 months of 2017, 58.9 million paint rollers were imported, up less than 1 percent from 58.7 million during the first 10 months of 2016. China sent 48.3 million paint rollers to the United States during the first 10 months of 2017. The average price per paint roller for October 2017 was 48 cents, up 1 cent from the average price for October 2016. The average price for the first 10 months of 2017 was 46 cents, down 6 percent from the average price for the first 10 months of 2016 of 49 cents. ﻿U.S. companies imported 21.4 million paintbrushes during October 2017, down 9 percent from 23.6 million for October 2016. Paintbrush imports for the first 10 months of 2017 were 220.3 million, up 3 percent from 214.5 million for the first 10 months of 2016. China shipped 199.5 million paintbrushes to the United States during the first 10 months of 2017. The average price per paintbrush for October 2017 was 25 cents, the same as the average price for October 2016. The average price for the first 10 months of 2017 was 29 cents, down 1 cent from the average price for the first 10 months of 2016. ﻿The total import of upright brooms for October 2017 was 1.5 million, up 25 percent from 1.2 million for October 2016. During the first 10 months of 2017, 14.4 million upright brooms were imported, up 4 percent from 13.9 million imported during the first 10 months of 2016. China sent 12.7 million upright brooms to the United States during the first 10 months of 2017. The average price per broom for October 2017 was $1.11, down 10 percent from $1.23 for October 2016. The average price per broom for the first 10 months of 2017 was $1.23, down 10 percent from $1.36 for the first 10 months of 2016. Export totals for the first 10 months of 2017 were down in three categories outlined: toothbrushes, artist brushes and paintbrushes, compared to the first 10 months of 2016. In October 2017, three categories reported decreases, compared to October 2016: toothbrushes, artist brushes and paintbrushes. ﻿The United States exported 5,187 dozen brooms and brushes of vegetable materials during October 2017, up 9 percent from the October 2016 total of 4,766 dozen. Exports of brooms and brushes of vegetable materials during the first 10 months of 2017 were 76,825 dozen, up 35 percent from 56,723 dozen for the first 10 months of 2016. The United States sent 34,330 dozen brooms and brushes to Canada and 12,838 dozen to Mexico, during the first 10 months of 2017. The average price per dozen of brooms and brushes was $45.27 in October 2017, up 29 percent from $35.15 for October 2016. The average price per dozen brooms and brushes for the first 10 months of 2017 was $36.55, down 22 percent from $46.87 for the first 10 months of 2016. ﻿During October 2017, the United States exported 10.1 million toothbrushes, down 19 percent from 12.5 million for October 2016. During the first 10 months of 2017, 112.9 million toothbrushes were exported, down 25 percent from 150.9 million exported during the first 10 months of 2016. The United States exported 31.1 million toothbrushes to Canada, 29.3 million to Germany and 16.2 million to Mexico, during the first 10 months of 2017. The average price per toothbrush for October 2017 was 56 cents, up 14 percent from 49 cents for October 2016. The average price per toothbrush for the first 10 months of 2017 was also 56 cents, up 22 percent from 46 cents for the first 10 months of 2016. ﻿The United States exported 2.3 million shaving brushes during October 2017, up 154 percent from 903,944 for October 2016. During the first 10 months of 2017, 14.7 million shaving brushes were exported, up 6 percent from 13.9 million for the first 10 months of 2016. During the first 10 months of 2017, the United States exported 6.8 million shaving brushes to Brazil, 3.1 million to Canada and 1.2 million to Mexico. The average price per shaving brush for October 2017 was 89 cents, down 52 percent from $1.85 for October 2016. The average price for the first 10 months of 2017 was $1.06, down 12 percent from $1.21 for the first 10 months of 2016. ﻿October 2017 exports of artist brushes totaled 866,611, down 62 percent from 2.3 million for October 2016. During the first 10 months of 2017, 8.2 million artist brushes were exported, down 12 percent from 9.3 million for the first 10 months of 2016. Canada received 5.7 million artist brushes from the United States during the first 10 months of 2017. The average price per artist brush was $4.25 during October 2017, up 130 percent from the average price for October 2016 of $1.85. For the first 10 months of 2017, the average price per artist brush was $3.82, up 6 percent from $3.60 for the first 10 months of 2016. ﻿The export total of paintbrushes during October 2017 was 124,610, down 35 percent from 191,745 for October 2016. During the first 10 months of 2017, 1.9 million paintbrushes were exported, down 30 percent from 2.7 million for the first 10 months of 2016. Canada imported 779,462 paintbrushes from the United States during the first 10 months of 2017, while the United Kingdom received 525,185. 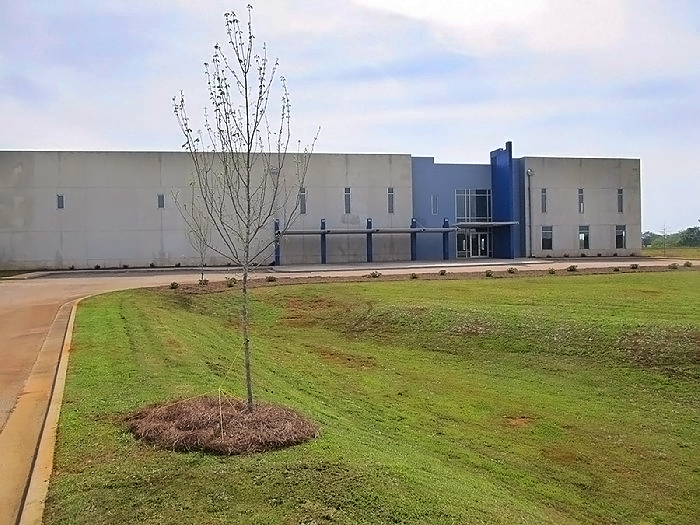 Golden Star has expansion plans for a third facility in Thomaston, GA. The new 78,000 square-foot facility is targeted to open Q2 of 2018, and will provide access to Southeast and East Coast Golden Star customers. Golden Star Inc., with corporate headquarters based in Overland Park, KS, has been in business since 1908. For more information contact: goldenstar@goldenstar.com. Borghi Polska Sp. z o.o. Pictured from left are: Mateusz Radzki, Borghi Polska president; Paolo Roversi, Borghi president; Anna Zawadzka-Wilk, Borghi Polska vice-president; and, Pawel Zawadzki, ANA BH. ﻿To strengthen its activities on the European market, especially in the central and eastern region, Borghi along with ANA Biuro Handlowe, has incorporated a new company: Borghi Polska. Borghi Polska will continue its activities in Poland, and it will be a service center for the area, to further support customers in the Czech Republic, Slovakia, Romania, Hungary and Ukraine. “I am very proud of being part of this new team. This new adventure will multiply my energies towards the market,” said Mateusz Radzki, president of Borghi Polska. “It is the natural continuation of the activities that my parents Malgorzata and Pawel Zawadzcy started in 1991, which I am honored to continue,” added Anna Zawadzka-Wilk, vice-president of Borghi Polska. For more information contact: www.borghi.com. According to a press release, The Malish Corporation had a successful ISSA 2017, in Las Vegas, with the introduction of several new products. Malish introduced a line extension to its award-winning Sonic Scrub line as well as additions to the grill brush and color-coded foodservice families of products. The newest products in the Sonic Scrub product line include a larger Sonic Scrub Mal-Grit Scrub (28-inch x 14-inch versus the original 20-inch x 14-inch, green in color), a 28-inch x 14-inch Sonic Scrub Clean-Grit (blue in color), and Sonic Scrub Mal-Grit (black). The newest grill brush is the Horseshoe Grill Brush, which is available with a choice of a flat wire head, round wire head or stainless steel head. 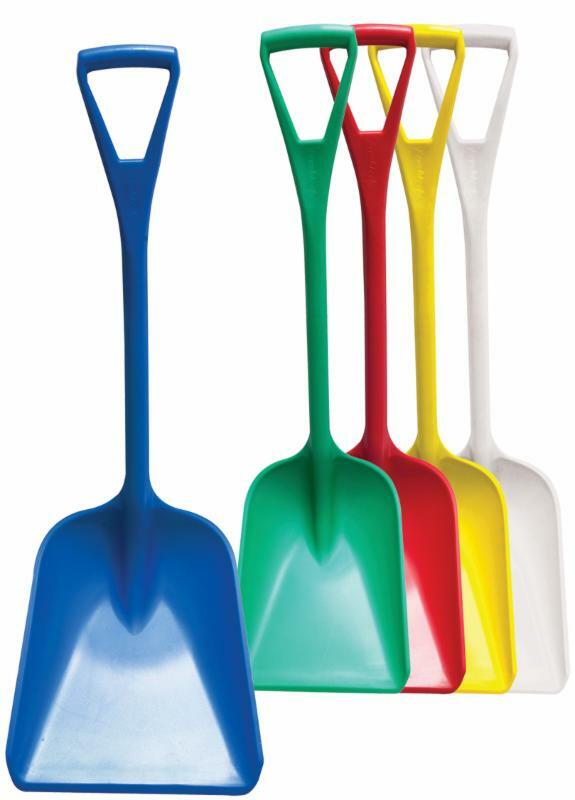 Malish also unveiled new color-coded sanitary shovels, which, like all Malish foodservice products, are HACCP-compliant. Household Gloves In The U.S.
﻿“Freudenberg is further expanding its household products business area. Freudenberg Household Products LP, known in the U.S. for its floorcare brand O-Cedar, has signed a final agreement to acquire the Playtex® Gloves business from Edgewell Personal Care,” according to a press release from the company. “Playtex® has been operating in the market for more than 65 years under the Living® and Handsaver® brands. Through this acquisition, we will be creating significant added value for our customers, and we will be able to offer an even better, more innovative product range to consumers,” Javier Sala, U.S. general manager of Freudenberg Household Products LP, said. Freudenberg Household Products LP is part of Freudenberg Home and Cleaning Solutions. The company portfolio includes the brands: Vileda®; O-Cedar®; SWASH®; Gimi®; Gala®; Wettex®; and, Marigold®. 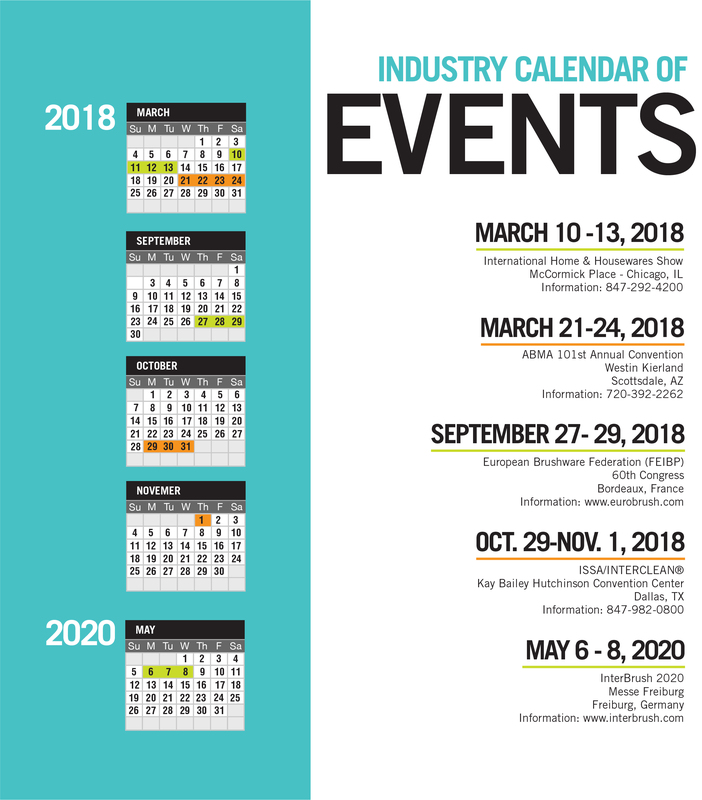 For more information, visit www.freudenberg.com. 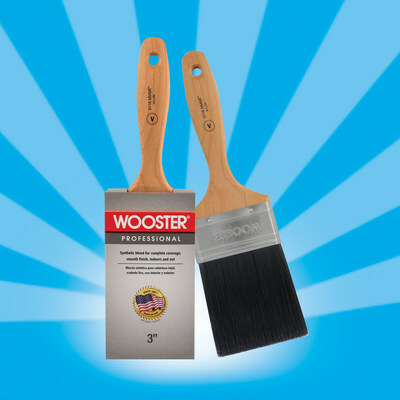 ﻿The Wooster Brush Company is reintroducing the 3-inch Miami paintbrush with a new, sealed hardwood handle. “Made of black nylon, the Miami performs exceptionally well in all paints, especially the fast drying and low viscosity coatings. It provides complete coverage and a smooth, professional finish, both indoors and out, making it the recommended brush for painting walls, ceilings, doors, fences, and decks,” said the company. The Miami is available as a 3-inch varnish brush and is manufactured in Wooster, OH. It is resistant to wear on rough surfaces and has easy-to-clean filaments. Learn more about Wooster Brush products at www.woosterbrush.com.